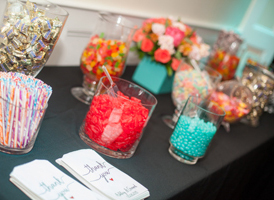 Candy Stations have become one of the most popular wedding day favors over the past few years! 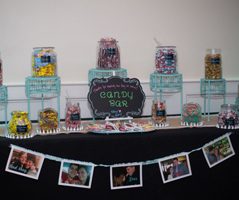 Candy stations are a great way to bring out a couple’s whimsical personality, and are always a guaranteed hit with the guests! 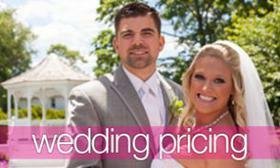 Some stations are unique and colorful, others compliment a couple’s wedding colors perfectly and completely! 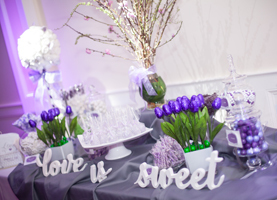 Whichever approach you decide to take with your candy station, we always recommend purchasing a little extra candy—just in case we need to replenish it for you! 2.) Jars and Holders! We have found that glass jars and holders work best! Different shapes and sizes will add a unique touch for your candy display. 3.) Scoops and Tongs for the different candy that will be displayed on your station. Little advice: scoops are always better for M&M’s, Sixlets, gummi bears, and little candies! Tongs are a better option for any wrapped candies, gummi worms, etc! 4.) Bags for the candy! 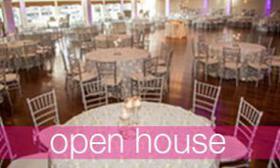 This is where you can get a little creative if you want! We’ve seen many couples provide monogrammed bags for their guests’ candy with their wedding date on it, just to add a little personalized touch for their special day. 5.) Signs! 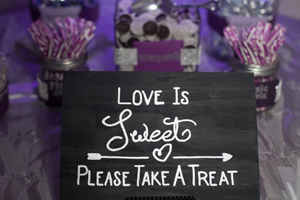 What better way to make a candy station yours, than by adding a cute sign for your guests to see! 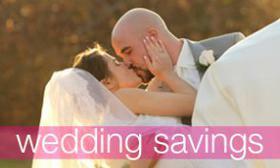 “Love is Sweet, Take a Treat” is one of our favorites! 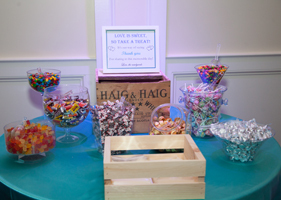 And of course, here are a few candy stations we’ve seen over the past year!